MARTIN, Tenn. — University of Tennessee President Joe DiPietro and his wife, Deb, made a final official visit Nov. 14 to the University of Tennessee at Martin, where they attended a campus reception in their honor. Dr. Joe DiPietro has served as the UT System’s 25th president since January 2011 and will retire from the position effective Feb. 14, 2019. His last active day in office will be Nov. 21. During the reception, Dr. Todd Winters, dean of the UT Martin College of Agriculture and Applied Sciences, and Dr. Phil Cavalier, university provost, presented DiPietro with the title of distinguished professor of animal science in the Department of Agriculture, Geosciences and Natural Resources. This is the first such title to be presented by UT Martin and acknowledges DiPietro’s career as a veterinarian before he accepted the position as UT System president. “I feel blessed by the fact that I came through with an 11-10 vote, and somehow, by the grace of God, I got the job. It’s been a privilege to serve you, and it’s been a real privilege to have you work so hard that we’ve broken four or five or six system-wide records. If you look at enrollment, if you look at fundraising, if you look at retention rate, don’t think you didn’t pitch in to make that all happen,” he continued. The UT Board of Trustees has appointed Randy Boyd, a University of Tennessee, Knoxville alumnus and businessman, to serve as the UT System’s interim president beginning Nov. 22. Boyd will serve up to 24 months or until a new president is appointed following an external search. 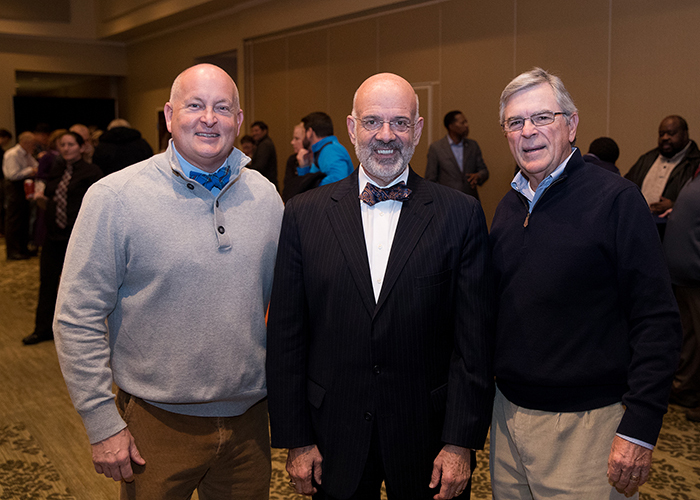 PHOTO ID: UT System President Joe DiPietro (center) is pictured with UT Martin Chancellor Keith Carver (left) and Crawford Gallimore, a former UT Board of Trustees member, during a farewell reception in DiPietro’s honor held Nov. 14 on the UT Martin campus.